The United States Senate has this week voted on and rejected a bill to approve the development of the controversial Keystone XL pipeline, that would deliver tar sands oil from Canada to refineries on the US Gulf Coast. Unlike many of the Senate decisions in recent years, going into it the final result was not a certainty, and it was only rejected by one vote in the end. The bill sponsored by Senator Mary Landrieu needed 60 votes to pass, and the final result was 59 to 41. Tar or oil sands is more carbon intensive than more conventional kinds of oil and oil extraction. For this reason, environmental groups and highly respected climate scientists, such as Dr James Hansen, have opposed the construction of the pipeline for years. Significantly, Dr Hansen has previously stated that if the Keystone XL pipeline is approved and Canada’s huge tar sands operation to extract oil from tar sands continues, it will be “game over” for climate. Although the Senate has rejected the Keystone XL pipeline project this time, the likely Senate Majority Leader of the next Congress, Senator Mitch McConnell, has already flagged that the pipeline project will come up again as soon as early 2015. 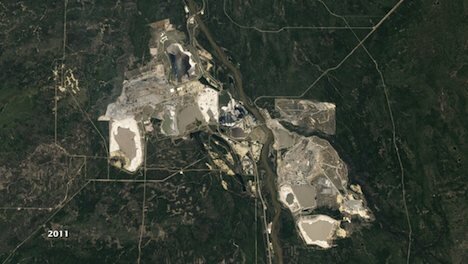 NASA image: Alberta tar sands in Canada.